Taste test: These are good and somewhat addictive thin-rippled barbecue chips with a really nice flavor and a slightly hot aftertaste. 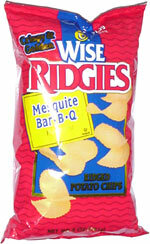 Among the major brands, these definitely stand out from the crowd of barbecue chips. Smell test: Pretty good mesquite barbecue smell.